Today is my birthday! I thought I'd get fancy for myself, with some silk, polka dots, pink, glitter and gold! Happy Birthday! I love your outfit, you look gorgeous!! Hope this year is a fabulous one for you! Happy Birthday, Katie! 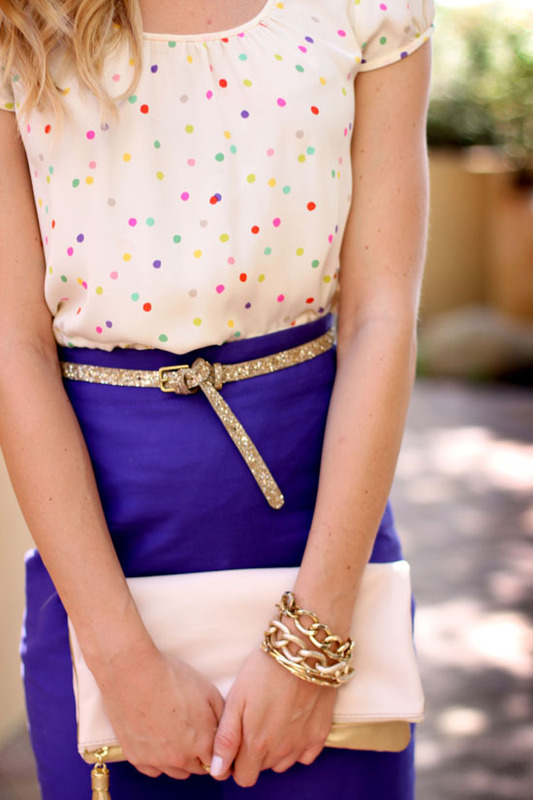 Loving the polka dot blouse - reminds me of cupcake sprinkles! Well happy happy birthday! A little glitter makes any day sooo much better! Perfect Birthday outfit! The colorful polka dots remind me of sprinkles or dot candy. Happy Birthday! Have the BEST birthday! Hope your day is filled with lots of love and laughter! I just picked up a nearly identical gold sparkle belt from Target and I can't wait to wear it. BTW-Your hair is gorgeous. Mine is similar color and length. I'd love to know how you get such soft and natural waves. Do you have a tutorial on the blog that perhaps I may have missed? Love love love the outfit. You look like a cute little cupcake!! :) Happy birthday!!! happy birthday! Love the outfit!! Happy birthday!!! August birthdays are the absolute best!! I hope your husband spoils you rotten...which I have no doubt he will! You need to share where you go thrifting because you always have the best finds!! You look gorgeous as always!!! Have fun! No way, today is MY birthday! Happy day to both of us! I am loving this birthday outfit...the colored polka dots kind of remind me of funfetti cake mix (a birthday essential). I love your top. Very fitting birthday outfit - it looks like a cupcake! Happy Birthday! Happy Birthday! This is a perfect birthday outfit! happy birthday! hope you have a wonderful day :) very festive (and appropriate outfit), love that the skirt and shoes are on sale at J.Crew! Happy birthday! This outfit is fabulous. Enjoy your day. Happy Birthday!! Hope your having an amazing day! Happy birthday, girl! You look amazing! Love your outfit! This look is absolute perfection for celebrating your birthday! Love love love everything about it!! that's a great birthday wish and a great outfit! loving the top and the gold touch is perfect! Happy Birthday! You definitely look like a gorgeous birthday girl! Happy birthday! Thank you so much for sharing your life with us. Following your journey makes me happy, and you are truly an inspiration to me. Beautiful woman, living a beautiful life. Best wishes for a great year! This is such a perfect birthday look, the top reminds of confetti, happy birthday! Your top reminds me of funfetti cake- in the best way possible! So cute! Wishing you a happy birthday! You look stunning! Happy Birthday! This is one of the cutest outfits I've ever seen. I love that KS top! Love the cheery look! Happy Birthday Katie! May the coming year bring your happiness and love. Happy happy birthday! I hope it was a fabulously wonderful day! Love your birthday get up! Too cute!! Love this whole thing! All these colors together are wonderful, but now that you say it's your birthday I can't help but thinking of a funfetti cake. Happy Birthday! Happy birthday! I hope your day is filled with your favorite foods, places, and people. I love how you dressed up too. I always do the same and it makes the 24 hours feel even more special. Happy Birthday. I just discovered your blog. I love your outfit, but I absolutely love your bracelets. I found a similar one on the J Crew website but for much more so thank you for this option. I will be purchasing soon. I hope you have the best birthday ever!! You look amaze as always! Happy Birthday! What a perfect outfit... full of fun and color :) I love your birthday wishes this year as well! Hope it was a beautiful one! Well happy bithday! and you couldnt have picked a more perfect blouse for the occasion! happy birthday Katie! i hope it's a wonderful one! Happy Birthday! Love your birthday get up! You got the blue skirt and pink shoes go perfectly with the cheery polka dot dress. Happy birthday! May this year be your best so far!!! Happy birthday!!! What a beautiful birthday outfit! that has got to be the cutest top i have seen in a while! lovely! Happy Birthday! You look so darling here! The polka dot blouse is so pretty and perfectly paired with the bright pink and purple. So girly, but so chic! Hope you had a great birthday! Love those colors! Happy birthday! Hope it was lovely. You look lovely. Happy Birthday! You look stunning and classy!! Looks like I'll be hitting up JCrew soon! Happy Birthday!!!! May all your wishes come true :) Also, when I was scrolling through your photos (before reading the text), I was thinking 'she looks so cute - like a birthday cake!' Ha! Happy Birthday! You look so stunning in glitter and polka-dots!! Your outfit is stunning, I love how you mixed and matched the electric blue and bright pink. Stunning! You might tire of this... but you're beautiful. And I love your blog :)! Love the pop of pink to keep it fun! The poke a dot shirt is adorable and feminine as well!! happy late birthday!!! your outfit is adorable and you look stunning! Obsessed with this entire outfit. Gosh, I am in love with that top! Ever since you instagrammed it, I've secretly been hoping I would find an identical one while thrifting. Happy Birthday! I saw your post just in time for that skirt to be on sale at j crew still. It just arrived in neon pink yesterday and I'm in love! J crew makes a mighty fine pencil skirt! Thanks for informing me just in time! You look amazing! This is put together so beautifully! A true birthday girl look!